Ironically as I’m writing this the weather is anything but spring-like. It’s tipping it down and I am wearing a cardie as it’s flipping freezing. I really hope this is just a teeny blip in the weather patterns and the coming week will bring more sunshine. In the meantime I’ve been going through some photos that I took in the garden this week intending to print some out and I thought why not put them up on my blog too so that I can look back at them on another cold and rainy day and have a virtual glimpse of sunshine. Ah the humble daffodil. My dad insists that these are weeds because they spread everywhere if you let them. I love them though. In fact I have a jar of daffs on a table next to me and their scent is bringing back wonderful memories of the garden at my parent’s house. Mum had a huge patch of daffodils at the top of the garden and Patch, my old dog, used to lie down in the middle of it like a big hippy. Hellebores always look so shy with their heads bowed to the ground like they wouldn’t say boo to a goose. Not everything is in flower. Our hydrangea is at the papery wisp stage that I love almost as much as when it’s in full bloom. The dried petals look like delicate lace butterflies and the gentlest puff of a breeze causes them to disintegrate. Hydrangeas are the litmus paper of the plant world. Ours normally flowers pink which I think means our soil is alkaline, not that I have the foggiest idea whether that’s a good or a bad thing. My mum-in-law is in charge of the flowers. Me? I’m a veggie grower through and through. Which reminds me, I must get on with planting the peas. I think I’ll wait for it to stop raining though. I daren’t touch flowers either, think I’ll see how we get on with our veggies for now. 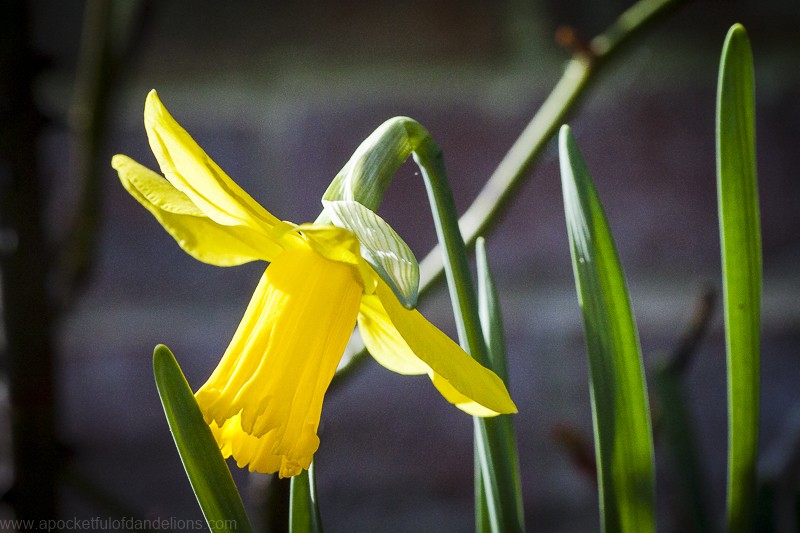 I have a big jar of daffs on my bedside table, weeds or not – they make me smile! I’m hoping this weather is just a blip too, I want (NEED) that sunshine back. Oh me too! I am constantly in denial about how much the weather affects my moods but since I am always grumpy and lacking energy in the winter I think it’s safe to say I am a sunshine girl! We had a tiny taste of spring Wednesday when the temps almost reached 60. We’re back to 20’s and 30’s and damp and chilly. It can’t last much longer. I love the color of your hellobores – so bright and cheery! Those little glimpses of spring are lovely aren’t they but they really leave me wanting more. I love the hellebores too, I wish I knew what varieties they were. I shall have to quiz my mum-in-law.